As part of the introduction program to Tilley Electric Vehicles a full size GMC Sonama pickup truck has been converted to all electric. The truck is outfitted with the TEV self charging system, modified automatic transmission and has everything that came as standard equipment with the truck. We have tested several vehicles and have found that GMC offers the best quality in construction and reliability for all conversions with the TEV system, said Carl Tilley, inventor of the TEV. 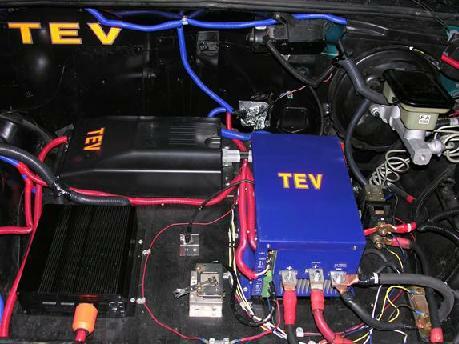 The TEV system is self charging and offers no need to plug in after use. Three charging systems are built in and employed to keep a constant state of charge on the system. Battery system is 12 off the shelf batteries wired for 144 volts DC. A special designed tilt bed allows for stowage of the battery bank which allows for full use of all the trucks working capacity as well as stowage and hauling. Extended Cab allows for two extra passengers or additional stowage. Top seed is 120 MPH and has an extremely fast take off. People simply do not want a small car with the speed of a golf cart and batteries in the back seat. They want full power and all the bells and whistles that come with American cars and trucks, said Tilley. 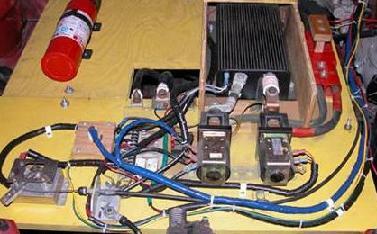 The power system is a 144 volt advanced DC motor combined with a new custom made computerized controller. This allows for the motor to transfer and consume large amounts of electricity to produce top speeds and fast acceleration. The TEV truck can carry heavy loads. 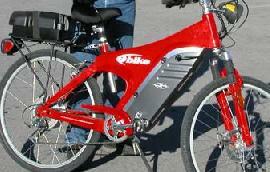 It has been tested with large trailers in tow with results equal of that prior to conversion of all electric. On board are three separate charging systems to maintain battery voltage. Each system can run in conjunction or separately according to battery charging needs. Also on board is a DC to AC inverter that can allow powering of AC power tools or as a back up generator for items up to 2,000 watts AC. Photo above is of electrical control center. 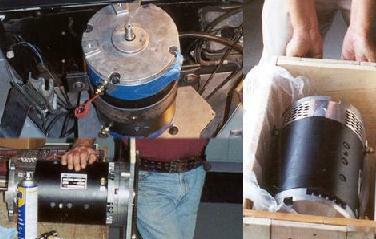 System can insert up to 1,200 amps into the motor with over 7,000 RPMs on the electric motor. A computerized control system has been updated to push huge amounts of electrical power into the system and be safe at the same time. Numerous safety features have been added including an automatic electrical disconnect in case of a car impact over 15 MPH. 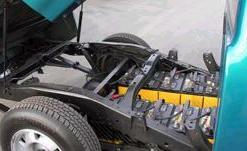 Road ready cars have the entire battery system incased and vented in a rubber and plastic confined area. A newly developed Tilley Foundation, Inc. “all electric ATV” named the TATV (Tilley All Terrain Vehicle) was put to the test this week…Climbing hills, over rocks and boulders, mud bogging, in and out of woods, in water, up steep grades and real rough creek washout areas. Test were preformed by some 10 different drivers at the Tilley Foundation complex and surrounding areas that are heavily wooded. Please make note that this configuration has an inverter mounted in the back to power lights, coffee maker, microwave, etc. One additional feature to be added will be an electric winch mounted on the front. We recently added a roll bar, additional lighting, undercarriage skid plate. “Test results were excellent,” said Carl Tilley. The Tilley Foundation and a new up-graded version of a charging device have ventured into the field of ATV’s, Golf Carts and Electric Bikes with the charging device that keeps batteries fully charged and has no need to plug it in. Carl Tilley admits that the speed is far to much at over 35 miles per hour and will gear it down to 15 miles per hour top speed for safety reasons. The TATV has interested people from fish and game law enforcement, Military applications, as well as, hunters and fishermen. – December 15, 2002 9:20 a.m.
First test was without charging device on the ATV . Total distance at full throttle was 7. 8 miles. Up and down hills . Batteries were completely depleted. Comments: Ran good until out of power, looks good, well constructed. Will be interesting to see what it dose with invention hooked up how far it will go. Second test was preformed with the charging device installed on the ATV. Total distance was set for the same as test # 1 at full throttle and 7. 8 miles. Up and down same hills. Comments: Blows my mind. I ran this thing very hard and expected to see it empty. It is full plus. I am a believer. With all this extra weight added I am amazed. I want one. Third test was without the charging device to observe time that Tilley all electric ATV would run in rough conditions in the deep forest and back country of Tennessee with rocky areas, river and creek areas , thick mud was apparent after almost two days of rain. Total Hours: 1 hour 02 minutes (verified by wrist watch , pocket watch and shop clock) ; Battery test after completion of run : No power to even move at all. Had to tow it back to shop. Comments: Takes to the brush and woods well. Climbs rocks and hills well. Very sturdy and tough construction. Ran well until out of power. Strange feeling to be in the woods and not have the sound of a gas motor running. Blew left rear tire near the end of test. Forth test was in same area as test # 3 but  with charging device installed  to observe time the Tilley all electric ATV would perform. Objective was to exceed previous run in time and check batteries. Comments: Had more power than last run. Put it to the test over everything I could find to roll over or knock down. Its like a small tank. Extended test, with permission of Carl Tilley, to run longer. Even used lights to get back to facility as it was almost night darkness. Fifth test was to determine any heat problems with motor, controller, battery cables and charging device under extended run. Test was set to be an extended at run full throttle for at least 15 with checks every 5 miles for heat problems. Battery test after completion of run (15 miles) : 41. 4 volts DC (tested with Fluke 336 meter). 1). Heat after first 5 miles : warm on motor, cables normal, controller hot, charging device warm. 2). Heat after second 5 miles : considered hot on motor, cables warm, controller very hot, charging device warm. 3), Heat on last five miles : Extremely hot on motor, cables warm, controller extremely hot, charging device warm. Recommendations : Larger battery cables and fans to cool controller and motor. Test was set up to run 20 hours in back country areas with two riders that would be consistent with the type of terrain that a normal ATV would encounter. Test would include hills, steep grades, rocks, heavy brush, water, mud, deep wooded areas and more. Every hour a test of the batteries would be made to establish state of charge on the all electric ATV by two separate inspectors . Wire and tape seal was placed on the charging device to insure no tampering was attempted. Top Speed: Unknown ; Total Miles: Unknown ; Total Hours: 11 hours 1 minute. Verified by radio communication Atomic Clock, wrist watch and shop clock. Comments: (David J. Preston) I fully expected this to flop. I have been in Robotics for 15 years and know nothing runs on a battery very long. Every test I did produced extraordinary results. Batteries continued to stay at full charge after this long run. It seemed to keep going and going. Did not notice any heat problems at the speeds we ran. Most of the speed was slow as we could not go full speed in the rough areas. I was tired after many hours bouncing in the woods. I simply can not explain my surprise. It almost scares me to think what this can do for the world. I have never experienced anything such as this in my life. It works. I have not the slightest idea how it works but it works thus far. Returned to Tilley Building at 5. 01 p.m. (total 11 hours 1 minute out) as we decided to finish test up tomorrow. Thomas is still completing his calculations of his part of the test and will combine the total at the end of the 20 mile run tomorrow. We allowed no one  to get near the ATV. The building was locked with Mr. Kindreed , myself and the ATV along with a armed security guard posted inside and one security guard posted outside the building. Food was delivered to use along with sleeping bags so we could spend the night in the building. No one else was allowed in or out. Miserable night but we were dry and warm. No one approached the ATV. 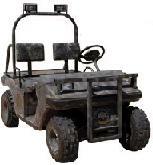 No battery charger or any other charging device was put to the ATV. Eighth test was the final 8 hours and 59 minutes that remain on the all electric 20 hour ATV test. Approximately 8 hours of testing would be in the same area as test # 7. Then return to the shop for testing battery condition. The last hour was set for rough all out full throttle run in the woods under extreme conditions to see how the frame and construction would hold up. Again the batteries would be tested. Two riders would be on the ATV at all times. Comments: Test conclusive. Every test was completed with flying colors. Specific Gravity test before and after run remained in the very good range . Voltage never dropped below 41. 5 Volts DC for the 36 volt DC system. Each battery test remained consistent with a fully charged system. Driving lights on the ATV were used for two hours from 5 a.m. to 7 a.m. Battery tested full after running and lights on. Very cold in these woods. Temperature was 23 degrees F. Ground was frozen until around 10 a.m. then it got extremely muddy. I admit I did everything I could to drain the batteries down. I was tough on this machine. Nothing I did seemed to slow it down except one steep bank we almost flipped the ATV. Seat belts are recommended. This machine never left my sight during the two day test.I am more than impressed at this vehicle. Extremely impressed with the Tilley group being open and straight forward and allowing us to have full control of testing anyway we wished. Carl Tilley is not what I expected a man of his intelligence to be. He is down to earth and the salt of the earth. A real nice person. In conclusion I must say it did what they said it would do. I am going to have many sleepless nights thinking how this test has changed my thinking of electrical systems and its applications. Last Test with a 1 hour and 20 minute run by Bell South engineer David Huffaker. David is a serious hunter in his off duty times. His experience is from a engineer and hunter prospective. Comments: Takes weeds and Brush well. Needs seat belts. For the average sportsman this will do just fine. Strong, sturdy machine. Good Clearance . Climbing ability good. Takes to mud very good. Below are certified test results for the Tilley Generator . This is almost the same type of system that was originally set up at the Tilley Foundation complex to power the shop building (1,800 square foot building) with the exception of less batteries. CONCLUSION: Test results of an 8 (eight) hour continuous test run reveled that the Tilley Commercial Generator maintained full state of charge under various load conditions. Power draw from the charging device drive motor was not factored into the power usage as the charger maintained battery voltage despite the load. There was no heating problem and the inverter maintained the surge power of all items used.If the item was to be used as a total house package a larger inverter system would be required. In a standard shop or construction site use as a generator with all 120 AC items it would achieve its objective. # No fuel of any sort was used. # No outside power from the utility grid was used. # No solar, wind turbine or water power was used. # No fuel cell was used. # The test was conducted with the Tilley Commercial Generator only. # Only two off the shelf 12 VDC batteries were used. # One Trace DC to AC 3,500 watt inverter with 5,000 watt surge was used. At the request of a United States Government Agency the Tilley self generation home power supply invention was tested back in June 10, 2005. The Tilley invention stated that it could produce electrical power without the assistance of any outside supply. The test was also to be used in court to prove once and for all that the Tilley device, under strict testing, could or would not perform as stated. – Master of Science, Engineering Management. – Registered Professional Engineer (Mechanical). – Bachelor of Electrical Engineering, with Honor. – Master of Science, Environmental. – Bachelor of Science, Physics. – Bachelor of Science, Chemical Engineering. – Master of Science Electrical Engineering. Also involved was a Tennessee State Certified Master Electrician. In addition the Government agency brought in an outside testing concern to assist. Qualifications included a BS in Electrical Engineering, MS in Electrical Engineering and a BS in Physics. Five Tilley Foundation Board of Directors were on hand, along with Carl Tilley and a large expanded contingency of security. The process and testing was video taped with cameras that captured every movement made. Only recently has this information been suited for release. The Government is restricted from indorsing any commercial product. However the information and test results were to be used in court if needed. Shortly after the test was compleated the legal matters concerning the validity of the Tilley device were dismissed. Not only was the test video taped but hand written notes and verification test sheet documents of June 10, 2005 conclusively proved the Tilley system works. Testing of the Tilley Shop Device by an outside concern was completed January 24, 2005 at a private location. A State Certified Master Electrician confirmed that the Tilley Device indeed works and far exceeded any expectations he had prior to the test. I was impressed, to say the least, with the ability of the equipment to continue producing electricity without an outside source of power, said the 35 year Master Electrician. 4 Tilley Foundation Board of Directors were on hand for the test, along with a film crew and tight security.A signed statement by the tester certified that he had no connection with the Tilley Foundation and that he was an independent tester for the benefit of a prospective buyer of the technology. The resulting test is evidence of the capabilities of this equipment, said the Master Electrician. The tester also stated that he has rarely seen any power as clean as the Tilley Device produced. This device provides cleaner electrical current than that on the grid power lines, said the Electrician. The name of the Master Electrician is being withheld to eliminate a barrage of phone calls and is reserved only for the prospective buyers, business Attorneys of the Tilley Foundation and its Board of Directors. To insure that there was no outside power to the device it was placed on the floor and the power to the grid was cut. Under heavy load the Tilley system consumed 27.9 amps (3,292.2 watts) and produced 38.2 amps (4,507.6 watts). AC voltage stayed at a constant 118.4 AC. This new generator device utilizes the generation of static electricity rather than cutting magnetic fields which has been common practice todate. Existing magnetic flux generators have an efficiency of about 80% of the energy used employed in turning the generator’s armature in order to generate electricity. Losses in boiler efficiency and in the steam turbine that rotates the armature increases the overall energy losses to approximately 50% of the raw energy of the fuel being utilized. This NEW generating device has has an efficiency rate of 300%. In other words, for each unit of energy required to rotate the generator’s shaft–three times that amount of energy in the form of electricity is produced when the generator is connected in parallel with a standard lead-acid battery (the same type of battery used in today’s automobiles). The static electricity from the generator keeps the batteries charged and the batteries supply direct current to an inverter that converts the direct current to 60 cycle alternating current (typical household current, or 220 volt, 50 cycle current as used in Europe). Some of the 110 Volt current is directed back to the motor turning the generator and the rest is available for other usage. This driven static electricity generator would provide all the normal electrical requirements for an average household in the USA or elsewhere. It would also contain a motor speed control that matches the generator speed to that of the household electrical load – the greater the load the faster the generator runs – as the load drops the generator slows down. This speed control and charge control keeps the batteries in a fully charged condition, resulting in an expected battery life of three (3) years or more. The direct operating cost for a household should be but the cost of replacing the batteries every three years! Approximately $25.00 per month! This generating device weighs about six pounds without a case and about nine pounds with a case and its size is slightly smaller than a standard automobile battery. A test is currently underway in which a shop – approximately 60′ x 40′ in dimension, is lighted and totally powered by the above described power unit containing eight standard 12V batteries. The shop contains an electric car hoist, lathe, drill press and the usual electric hand tools. The load averages three to five kilowatts at 110-volts AC. The peak load (car hoist operation) starting load is perhaps double that. There are also 14 twin 60 watt fluorescent light fixtures used for lighting – and they are not turned off. There is no external electric power connection to the shop. 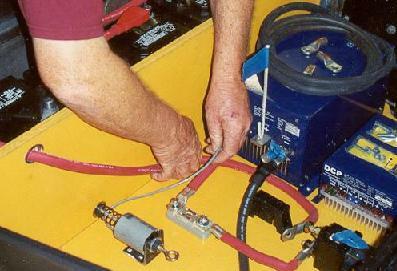 A computer has been set up and the appropriate metering devices connected so that the computer will measure constantly, the current flow to the electric motor (1/2 HP) driving the generator; the output of the generator; output of batteries (if any) and output of the 10 kilowatts inverter, This test will be run for two weeks and the data should be available this month. A registered test engineer with a certified testing company will verify the accuracy of the measuring instruments. As is obvious from the above, the generator unit is completely non-polluting in all aspects – no fossil fuels are used to produce power. 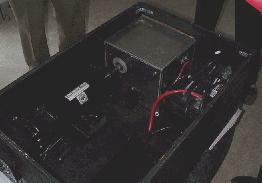 As reported to us, this small generator pack has produced 1 million watts of electricity in 12 days. The requirement for new power plants plus transmission and distribution lines could be vastly reduced. It would appear logical that the existing electrical utilities would install this device in residential and small commercial establishments and lease and maintain as appropriate the facility, the existing billing and service units of the utility would be thus employed. As is the case of this unique electrical generating system in residential and small commercial units, generator is completely non-polluting and environnentalty clean. No gasoline or diesel fuel exhast, no charging of batteries, etc. The inventor has formed a company to handle this invention. Their plan is to sell the technology to appropriate organizations around the world that will manufacture and sell and/or lease the equipment as appropriate. A U.S. patent pending has been filed. As with all noteworthy inventions the technique in building these generators is fairly simple and much less complicated than designing and building a new type of internal combustion engine. This report filed by Ed Anderson, Chairman of the Board of Minnesota Global, Inc. and Charles Sherlock, B.S. Engineering. Both have observed and measured the inputs and outputs of this new generator.